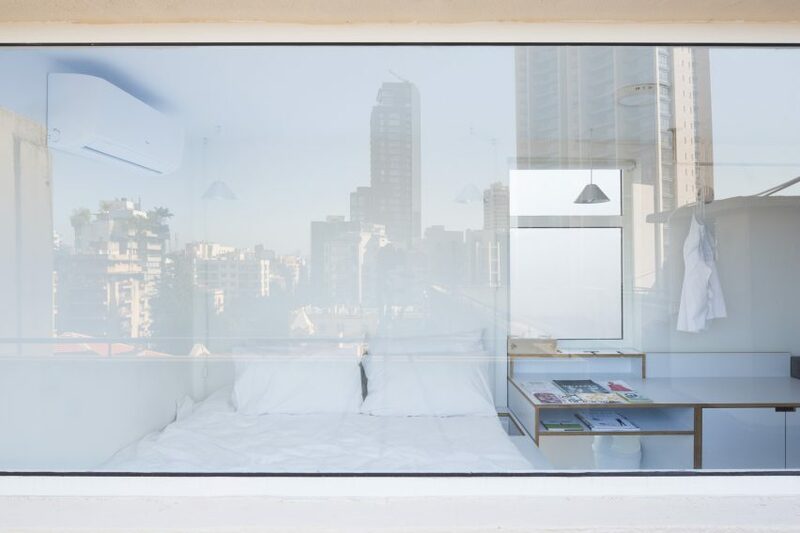 Lebanese studio Eliemetni has squeezed everything a guest could need into a micro studio apartment on the roof of an old building in the Achrafieh district of Beirut. The architecture, interior and product design studio reconfigured the aptly named Shoe Box apartment for a client who rents it out to short stay visitors on AirBnB. With just 15-square-metres of floor space to work with, the team painted the room white and coated the floor in white epoxy to maximise the reflected light from large windows either side. The whole apartment has been fitted with custom-built space saving furniture made made from white laminate plywood, with brushed aluminium light fittings and a pair of chairs made from beech wood and painted steel. Tables and stools can be extended and packed away as needed so as not to clutter the two-metre-wide room, and storage spaces have been integrated to almost every surface. “The brief of the client was fairly simple: to create a fluid space, capable of providing a sleep space for two people and accommodating around five people,” explained Metni. Within these parameters – and the limitations of 15 square metres – the studio sought to create “a powerful sense of pleasure, simplicity, ease and efficiency”. The apartment is open plan with a small bathroom partitioned off behind a glass door at one end. Furniture is arranged around the exterior of the apartment to allow guests to move around more easily. At the opposite end of the apartment the need for a cumbersome pair of bedside tables has been eliminated by a couple of nifty workarounds. The queen-sized bed has compartments equipped with charging ports set into the raised frame for guests to keep books, glasses and electrical devices, and two reading lights are suspended from the ceiling. Storage space has also been built in under the bed, comprising a pull out drawer, a cupboard and a set of shelves. Flexible furniture in a uniform material is often the key to making micro-apartments work. Studiomama designed custom plywood fold-out furniture inspired by boat cabins to furnish a 13-square-metre space designed in a former London cab office. London studio Ab Rogers Design used plywood for the space saving solutions in their 19-square-metre concept studio that includes a mezzanine bed with storage built into the stairs. 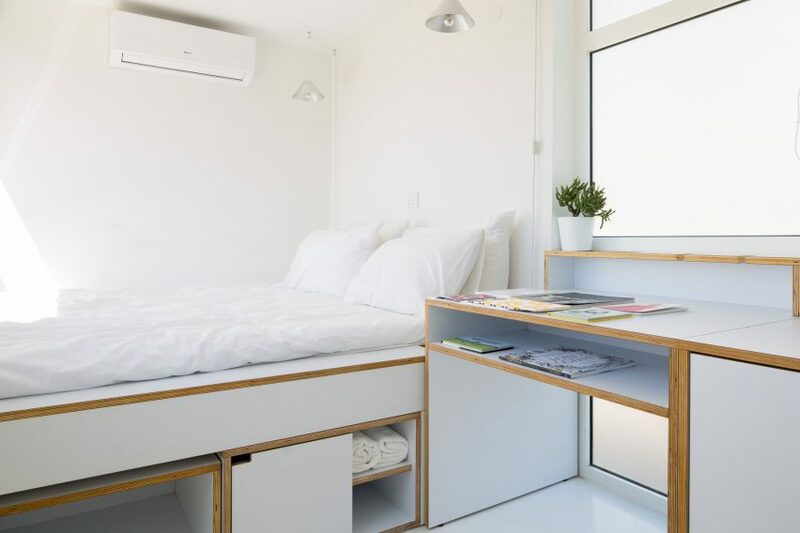 Naimi Architecture used what they dubbed “smart furniture” to carve out extra room in a 25-metre apartment in Barcelona, sinking storage spaces into nooks in the walls and designing a bed unit with built-in storage. 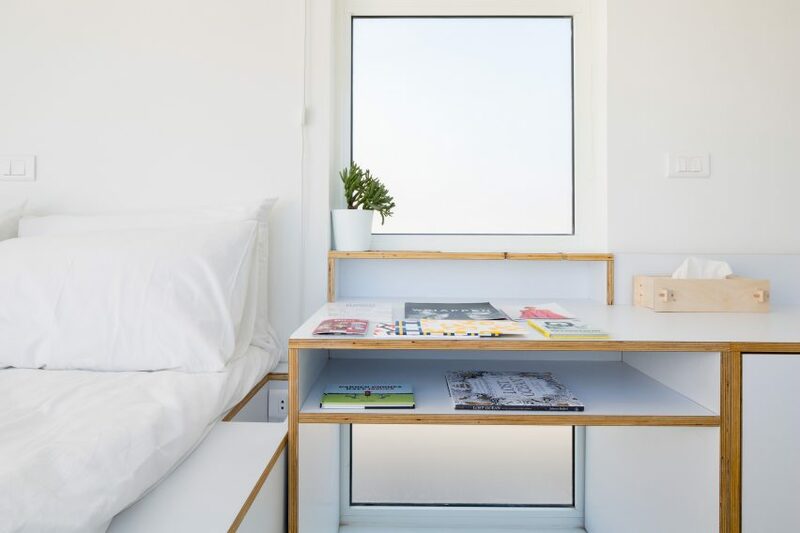 In the Beirut Shoe Box, a table next to the bed can double as a desk, with an open shelf beneath and slots cut into a shelf under a window to accommodate charging cables for a laptop. An adjoining cupboard doubles another flat surface and a rail fixed to the ceiling above it can be used to hang clothes from. The sofa bench has more storage space underneath, with slots for two smaller pieces pieces of furniture that can slide out and be used as a foot rest and a coffee table. Two chairs can tuck in beside each other under the table, which can be extended or rolled back as required. Compartments cut into shelf below window can be used to hold vases, condiments and cutlery. A section of the TV stand is completely detachable and has a cushion set into the surface, so that it can be moved and used as a stool. 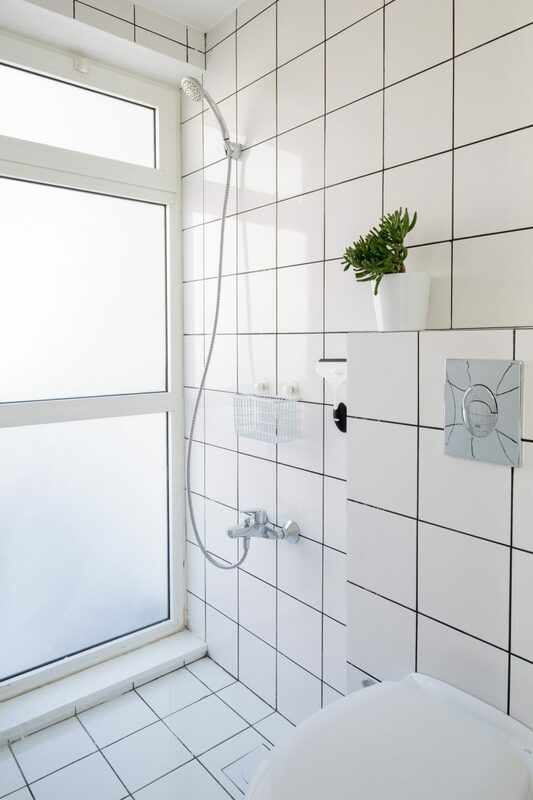 The kitchen and wet room areas are fully tiled in matching white squares with contrasting black grout that creates an interesting geometric pattern. 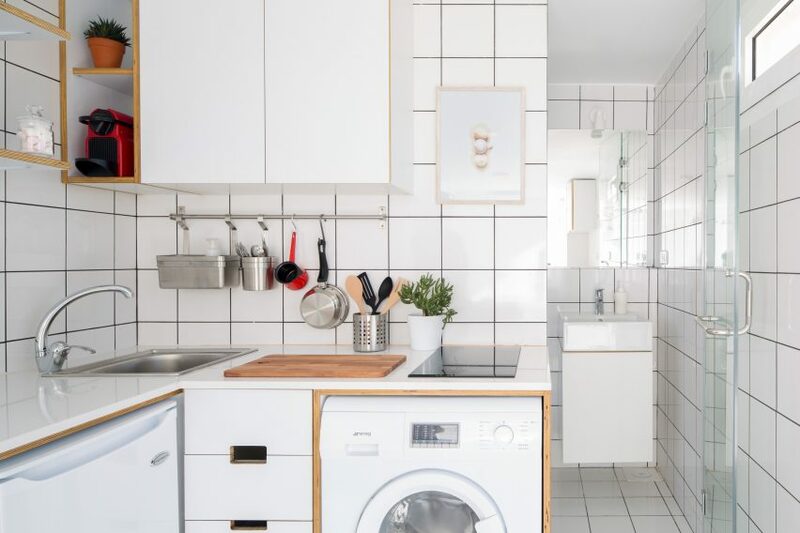 A compact kitchen includes a mini fridge, a sink set into the corner, a set of drawers and a washing machine with space for prep and a hotplate for cooking on top. Racks, cupboards and shelves fixed to the walls have space for utensils and crockery. Separated by a glass door, the wet room contains a shower head, toilet and sink unit and is lit by a large frosted window. The flat also comes with access to a sizeable outdoor roof terrace with views out over the Beirut skyline, which can be seen through the large window at the foot of the bed. With land at a premium in cities all around the world, architects are being required to devise increasingly ingenious solutions for small living spaces. 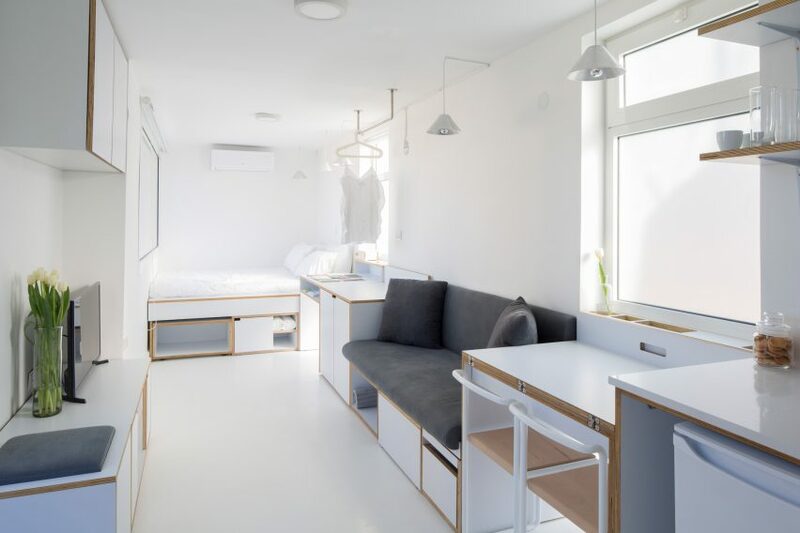 In Moscow, Studio Bazi fitted a 35-metre-wide apartment with a raised “sleeping box”in the back corner of a micro apartment to create a private sleeping space with extra storage room. Architecture and design studio Design Eight Five Two overhauled a 51-square-metre flat in Hong Kong using sliding furniture and even a built-in cat bed to make the most of a small apartment’s floorspace.